For many book collectors, the value of their antique books is more than a specific monetary value. Often these collectors search out antique books to add to their collections based on their love for a particular subject, author or style of literature. For these individuals, the intrinsic worth of an antique book lies in the special meaning the book holds for them. In addition to books written about the value of books and printed price guides, there are also excellent online resources and price guides to assist in determining the values of such books. An informative free resource, Fadedgiant Books provides an online database of antique book prices for more than 50,000 antique books. Fadedgiant uses auction prices to determine the current values of antique, out of print, collectible and old books. This type of value is known as market driven value, and this gives you a realistic value rather than the retail value the book would sell for at a bookstore or from an online antique and collectible book website. Since the condition of a book is such an important factor in determining its value, this guide should only be used as an indicator of the range of the market value of a specific book. Abe Books is the largest online bookseller with more than 12,500 independent booksellers listing more than 60,000,000 antique, used, rare and out of print books. Once you find the book you are trying to value, remember the price listed is the asking retail price, not necessarily the price it will sell for. Biblio represents more than 5,500 independent professional booksellers with over 50,000,000 books and offers many antique books from a large number of book sellers throughout the world. Similar to Biblio, AntiQBook hosts more than 900 book sellers, most of which specialize in antique books. Alibris is similar to Abe Books in determining book values and the prices given are the retail prices of the books. With more than 10,000 booksellers and an offering of over one million books, Alibris provides a wide selection of old, rare and antique books for sale. The monetary value of an antique book, just as the value of all antiques, varies based on current market demands and where the book is being bought or sold. Generally, rare book values are not a specific dollar figure. Instead a dollar range is used. The following are brief descriptions of the different types of values. The insurance value, generally the highest retail value, is a formal written appraisal and is the amount it would cost to replace the book if it is destroyed or stolen. 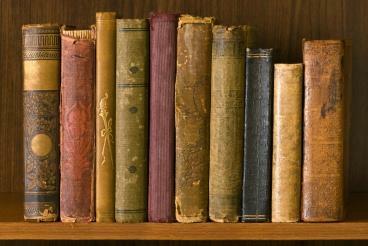 The retail price, or retail value, is the value of the book when sold at an antique store or antiquarian book dealer. Fair market value of the book is an agreed upon price when neither the buyer nor the seller is under any pressure to sell or to buy. The tax value, or estate value, is the average prices similar books sold for at auction. The IRS determines the estate value. The auction price is the open market price a book would generally sell for when neither the seller nor the buyer has to sell. The wholesale price is the price a dealer pays for the book, which is generally 1/3 to ½ less than the retail price on the secondary market. Another method of determining the value of an antique book is comparing it to one that sold on eBay. Always make certain you compare a book that is in the same condition as the one you have and use the search tool for completed auctions. Whether you are new to the world of antique books or have been collecting them for many years, a current antique books price guide is an important resource for keeping you updated on the fair market value of books you own or are thinking of adding to your collection. The values of antique books are important to many book collectors that add these to their collections as a future investment. However, there are also those that add books to their collections for personal and sentimental reasons. Even these collectors should be aware of the value of the books they purchase to ensure they are paying a fair price.